Amazon best quality Dry Erase Board is here! Perfect size white board for presentation, teaching, displaying or score counting for office, home, school or any other places! Please peel off the protective film on the surface of the white board before you use! MAXTEK magnetic white board offers you 1 eraser, 3 pens and 6 magnets. It also comes with a detachable pen tray. Without any waste of your time to buy other accessories, get this one to satisfy all of your needs! Magnetic writing surface requires ongoing cleaning care to ensure the best performance and resist ink staining and ghosting. Simply use any dry erase board eraser after continuous use to clean the writing surface. Silver aluminum frame provides a firm and rigid board construction. This dry erase board is moisture-proof, anti-deformation and rustproof, which creates a long lasting reliable product. This large white board comes with a removable marker tray to keep your markers, erasers and cleaners within easy reach. Keep the area neat and presentable by storing supplies on the tray, instead of in random places. All dry-erase markers work well with our dry erase board. It is easy to dry wipe without leaving any stains or ghosting traces. Simply use any magnets or magnetic pins to pin all of your notes, memos, pictures, calendars, menus or reminders etc. on the surface of the whiteboard. We offer Life time warranty, totally NO RISK order for you. Just Add to cart! MULTIPLE INSTALLATION WAYS: MAXTEK white board comes with metal hooks both on the long and short side, so it can be hung horizontally and vertically as you like. The movable hanging hooks allow you to adjust hanging distance easily. Moreover, you can choose to mount the dry erase board firmly on the wall with the 4 wall screws & 4 anchors covers. Whether you need a landscape position or portrait view, MAXTEK magnetic white board can meet your requirements easily. SMOOTH & DURABLE WRITING SURFACE: MAXTEK dry erase board comes with a smooth and durable writing surface, anti-scrap, easy dry wipe and compatible with all dry-erase markers. The surface of this dry erase board also creates high contrast markings. 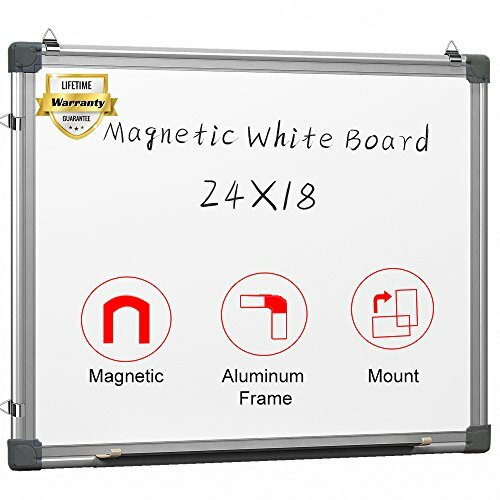 PREMIUM QUALITY & SAFE SHIPPING: MAXTEK dry erase board is surrounded by a highly robust and aluminum frame and covered with four ABS plastic corners, that makes the white board to be a long lasting reliable product. Lightweight but sturdy design ensure the white board not to warp. And all MAXTEK whiteboards are shipped in multi-layer reinforced padded shipping boxes for max protection. 100% SATISFACTION GUARANTEE: For any reason you are not 100% satisfied with MAXTEK Whiteboard, please do not hesitate to contact us right away. Our hassle-free customer service team will work hard to solve any issue that you come across with this magnetic whiteboard.